Give your black tie look some personality. 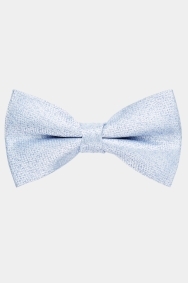 Whether you’ve got a special event or simply love the charm of a bow tie, this one is worthy of a place in your collection. The textured material ensures you’ll look on-trend, and the sky texture will brighten up your outfit. It’s pre-tied, so simply adjust the strap to fit you then put it on. Wear it with a textured grey or checked blue suit. Although the customer service was great, the product was not great. The material and colour was good but bow tie clip kept coming off when I wore it.